If I told you that Mike Myers had made “Supermensch,” you might think it was to superhero movies what his “Austin Powers” films were to the spy genre. But you’d be wrong. 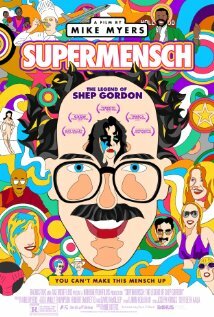 The full title is “Supermensch: The Legend Of Shep Gordon,” a documentary by Myers about the show business manager who turned Alice Cooper into a star, and guided the careers of artists as varied as Blondie, Teddy Pendergrass, and Anne Murray. When Gordon became interested in cooking, he began working with celebrity chefs like Emeril Lagasse and created the platform from which their careers launched. He started the first independent film company in the US (before even Miramax), called Alive Films, which produced “Kiss Of The Spider Woman” and “Stop Making Sense,” among others. Along the way, Gordon never married and never had kids, though he dated lots of beautiful women (including Sharon Stone), became quite wealthy, and bought a seaside retreat in Maui — but the “mensch” part of his title comes from the things he’s done for others that go above and beyond. Watching the movie, I marveled at the life he’s led and the ideas he’s executed for his clients. It’s a fun bio of a music and movies insider I (and probably you) had never heard of, with comments on Gordon’s life from people who knew him, like Michael Douglas, Sly Stallone, Tom Arnold, and Willie Nelson. Click to see my full Movies You Might Not Know list.